In recognition of National Coming Out Day, Lipscomb’s LGBTQ+ students painted the Bison rainbow colors, standing around it from early morning until evening on Thursday in support of the LGBT community on campus. Throughout the day, doughnuts were handed out, faces were painted and conversations took place. The students had conversations with the student body and sought to educate outsiders on what it means to be a part of the LGBT community to anybody who stopped by the community gathering around the Bison. 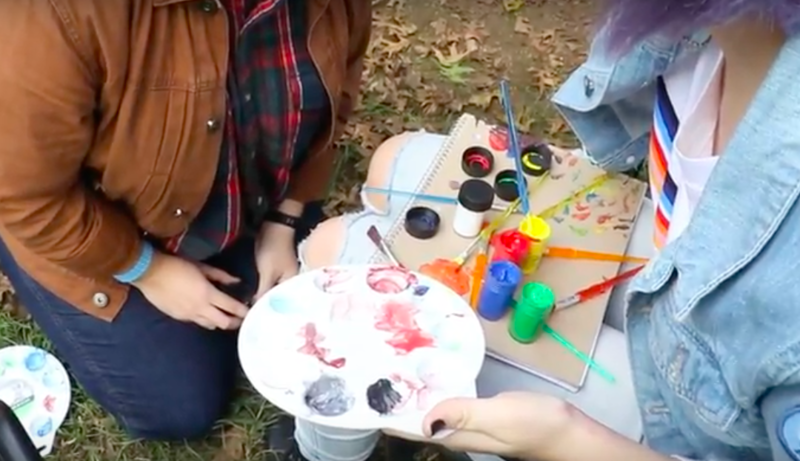 Last year on Coming Out Day, the Bison was painted over by a different student after it had already been painted rainbow colors by students in the LGBT community. This year, the gesture went over more peacefully. Multiple students who quietly disagreed with the message of the rainbow-colored Bison declined to comment to Lumination. But as people passed the Bison, multiple students pointed and captured pictures in secret from afar. LGBT students said this day was also an attempt to encourage students not to fear their sexual identities, as some people say they find their sexuality and spirituality in conflict. Dr. Paul Prill, director of the Honors College, is an unofficial advocate for these students. Prill was outside with the students throughout the afternoon, sporting a rainbow bowtie. President Randy Lowry attended a dinner for the students on Wednesday night in order to have conversation about their experiences on campus. Student life representative Dannie Woods also acts as an LGBT student liaison. For further information, visit Woods at the Student Life Office located in the Bennett Campus Center.